The famous Black + Decker name is a household word that implies quality, excellent design, and superior engineering. Their air fryer line is fairly new and has generated plenty of excitement in the world of air frying. Black+Decker has ventured into the air frying world, and with the B+D name behind it, these air fryers are drawing attention. Available in black or white, these manual machines pack a surprising amount of punch. The air fryer and a brief recipe book, which includes a timing chart, is included. The Black+Decker Purifry is white. It’s 12 pounds, 11.5×11.5×13 inches, and has a capacity of 2 liters or 8 cups. The interior capacity, which will fit a 4 or 5-inch pan, is smaller than that of most air fryers. Making its debut on March 27, 2016, the HF100WD model is slightly heavier, at 12.5 pounds, and smaller (11.1×9.8×11.5) than its ancestor. It retains the same cooking capacity of 2 quarts, or about 8 cups, and the same features, accessories, and appearance. The newer model is equally popular. The basket is stainless steel with a non stick coating and ‘cool-touch’ handle. Its capacity is about 8 cups, which is sufficient for cooking two meals at once. While the benefits of manual controls can be debated, they allow more finesse on the part of the user. The majority of complaints about air fryers from experienced air fryer owners are about software malfunctions. The B+D is strongly built, and the manual controls generate far fewer customer complaints than digital controls generally do. Manual controls allow greater control over the cooking process. This model has been on the market since September 19th, 2014 with almost no complaints about durability. The controls consist of a timer, which automatically shuts the machine down when the time is finished, and the temperature control. The ‘cool-touch’ handle is a feature unique to this air fryer, as is the basket’s divider. It is difficult to write a review about the Purifry that comes across as neutral. These are very solid little machines with few flaws. Most of the reported problems with this air fryer are issues that pertain to air frying food in general and could be solved by a little online research about how to air fry food. No accessories come with the Purifry. A small cooking manual with a timing chart is included. Air fryer accessories from other brands may not fit the Purifry because of its small interior capacity. Black+Decker does not offer a line of air fryer accessories. The PuriFry is said to have a strong odor when first used. Owners of this machine recommend running the air fryer for 30 to 40 minutes, empty, to burn off the smell. The manual controls may be difficult to read for people with poor eyesight and the capacity is not large for an air fryer, although the small size may be ideal for 1-2 people. There have been isolated reports of the screws on the basket coming loose after several months of use. Black + Decker offers a 2 year limited warranty. This warranty is superior to the industry standards for air fryers, which typically cover only 90 days to one year. Should I Buy the BLACK+DECKER HF100WD? The PuriFry is durable, with virtually no reports of malfunction in the three and a half years it has been on the market. It has a solid warranty and is sold at a very reasonable price when compared to other name brand models. The Black & Decker Purifry is an air fryer that bridges the gaps between bargain basement pricing and high end features, between compact size and adequate capacity. This simple, manually controlled air fryer sports a sleek design as well as helpful features, such as a basket separator that allows you to cook two types of food at once. This model is essentially the same as the newer HF100WD. The only differences are the slight changes in appearance and weight. Basket separator allows you to cook two kinds of food at once. Nonstick surfaces and dishwasher safe removable parts make for an easy clean up. Sixty minute timer and 400 degree temperature range exceed that of most comparable models. Some may find that the small lettering on the control dials is difficult to read. Additional accessories are not available from the manufacturer. When you unpack your Black & Decker Purifry air fryer, you will find the air fryer appliance, a removable pan, air frying basket, and a basket separator. The instruction manual will help you get to know your machine, with usage tips such as recommended temperatures, cooking times, and food quantities. This sturdy little air fryer comes in two colors: a black and stainless steel exterior, or a white exterior with a black control panel. The primary component of the exterior is plastic. Its controls consist of two manual knobs, and indicator lights are located on the appliance face. The base of the Black & Decker Purifry is 9.8 inches by 11 inches, and it is 11.5 inches in height. This gives it a slightly smaller footprint, and requires less overhead counter clearance, than many comparable models. The Purifry weighs approximately 12.4 pounds. The Black & Decker Purifry has a 2 liter (8 cup) capacity, allowing you to prepare two to four servings of your favorite food at once. That means you can cook up to one pound of French fries in a single cycle. Uniquely, this model features a basket separator that allows you to prepare two different kinds of food at once. The air fryer basket and separator have a nonstick coating and are dishwasher safe, ensuring an easy cleanup. Accourding the the manufacturer, the nonstick coating is “stable, inert, non-reactive, non-toxic and are PFOA-free.” The pan beneath the basket also has a nonstick coating, but it is not dishwasher safe. This model is equipped with a 60 minute timer, allowing cook times twice as long as comparable models. This air fryer is capable of reaching temperatures up to 400 degrees Fahrenheit, 10 degrees hotter than most comparable air fryers. This energy efficient appliance has a wattage of 1200 to 1225 watts and a voltage of 120 volts. The Black & Decker Purifry air fryer uses manual control knobs, one for temperature and the other for cook time. The variable temperature control can be set within the range of 175 degrees to 400 degrees Fahrenheit. There are also two indicator lights for your convenience. One lights up when the appliance is powered on. The other alights during the preheat cycle, and turns off to let you know that your desired temperature has been reached. The cooking timer may be set up to 60 minutes, allowing for cook times twice that of many similar models. The removable basket has a nonstick cooking surface for ease of cleanup. A unique feature of this air fryer is the basket separator, which allows you to prepare to different kinds of food at once without mixing their flavors. This Black & Decker model has the added safety features of a cool-touch handle and auto-off function. When the specified time is reached, the appliance automatically shuts itself off. The basket handle is designed to remain cool even when the basket itself reaches 400 degrees, helping to prevent accidental burns. Dedicated accessories for the Black & Decker Purifry are not currently available. Some universal air fryer accessories may work with this model. Black & Decker specific cookbooks are available. More than fifty percent of users give the Black & Decker Purifry air fryer highly positive ratings. Comments such as “amazing,” “fast,” and “beyond my expectations” are common sentiments in consumer reviews. Customers also deem the Black & Decker Purifry a “great investment” due to its low price. The most common complaint about the Black & Decker Purifry was that the small lettering on the control dials is difficult to read. Some said that they would prefer digital controls. 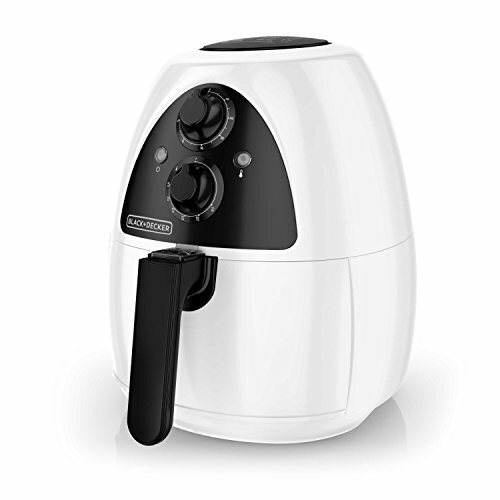 The Black & Decker Purifry air fryer has a two year limited warranty from the manufacturer. Additional warranties may be available from your retailer of choice at the time of purchase. Dual convection fans circulate heated air efficiently. The included basket separator allows you to cook two of your favorite foods at one time. Dishwasher safe, nonstick parts allow for easy clean up. Extra long 60 minute timer and super hot 400 degree temperature controls give you more customized cooking versatility. Two year warranty is double that of most other models. Should I Buy the BLACK+DECKER HF110SBD? 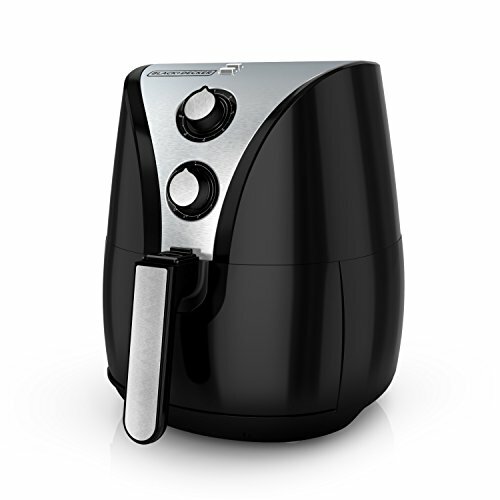 Nearly 80 percent of users would recommend the Black & Decker Purifry air fryer to others. This model performs well in comparison to similar models, creating crispy treats. Its nonstick, dishwasher safe parts make cleanup a breeze. It excels in timer length, maximum temperature, and in length of warranty. All of this comes as a great price, as this model rests on the lower end of the air fryer pricing spectrum.